The Amazing Golden Sahara I. 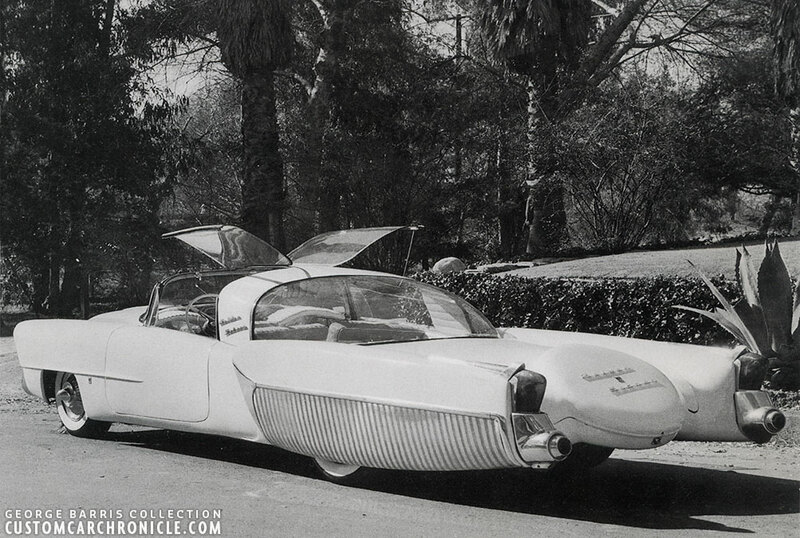 The Futuristic Car designed by Jim Street that was the perfect combination between Custom and Show Car. Special thanks to Jim Street for his stories on the car and how it was created. In the late 1940’s early 1950’s there is a young guy from Dayton, Ohio, Jim Skonzakes, who dreams about living in warm, sunny and dry Los Angeles, California. He sees himself driving there in the most fantastic Custom Cars. But being needed in his parents successful Dry Cleaning business prevents him from actually making the move to the West-Coast. 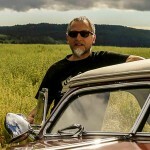 Instead he started building his own Custom Cars and Custom Bikes in Dayton, and when time allowed it he jumped in his Custom Car and drove the 2200 miles to California. There he spend some good quality time looking for Custom Cars, visiting the shops he has heard about, going to shows, and making new car friends. Jim Skonzakes (Street) always said he had Customizing in his blood, he just could not help it. Everything he had needed to be Customized. So the industrial dry cleaning machines in his parents business were not save for Jim’s urge to customize either. All the machines were detail painted and parts send out to be chrome plated, for that extra special Skonzakes look and touch. 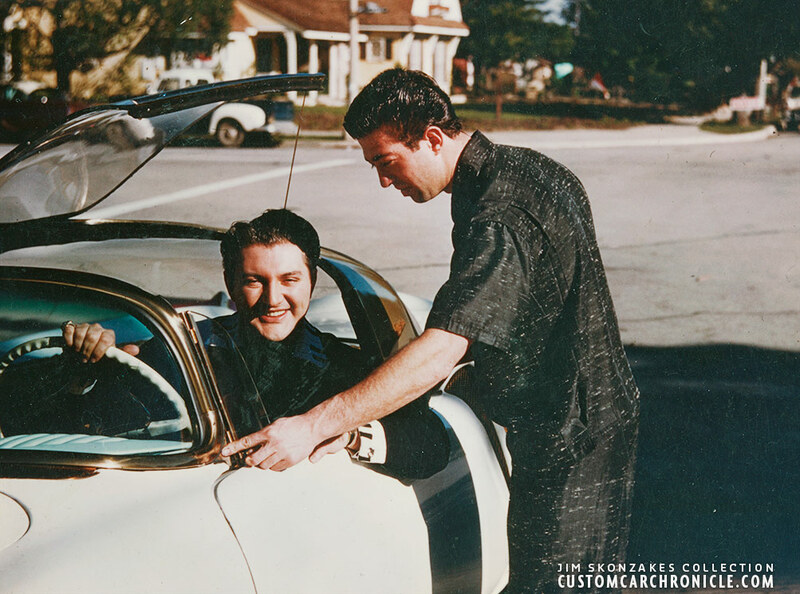 One of his California trips in the late 1940’s, perhaps early 1950, Jim meets George Barris and starts to hang out at the Barris Kustom Shop. At one of Jim’s longer stays Jim even rented a part of the Barris shop where he could built his own custom, a 1949 Buick, with the help of some Barris employees. In the meantime Jim drives from LA to Dayton several times a year, mostly in the Custom Cars he owned at the time. On one of his LA visits he buys the Jack Stewart 1941 Ford, and a few years later when he is back in LA again he heard about George having had an accident in his personal mildly customized 1952 Lincoln. The wrecked car was in bad shape, however the cars engine and drive train appeared to be intact and was low mileage since George had not used it a lot. This would be the ideal base for a project Jim had on his mind for some time and started to discuss it with George Barris. 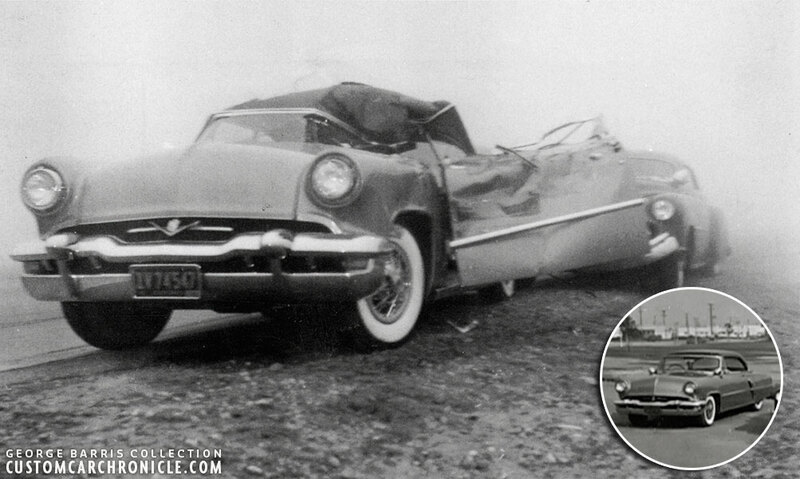 George Barris took this photo shortly after having the accident with his 1952 Lincoln. George was towing the Dan Landon 1949 Chevy behind the Lincoln when out of nowhere a hay truck appeared on a very foggy day. George his Lincoln was totaled, and Dan’s Chevy had some damage as well, but not too bad. Fortunately nobody was really hurt in the accident, and the totaled Lincoln would later become the base for the Golden Sahara. Some sketches of a very futuristic car where made and further plans discussed and Jim’s Dream Custom plans slowly took shape. 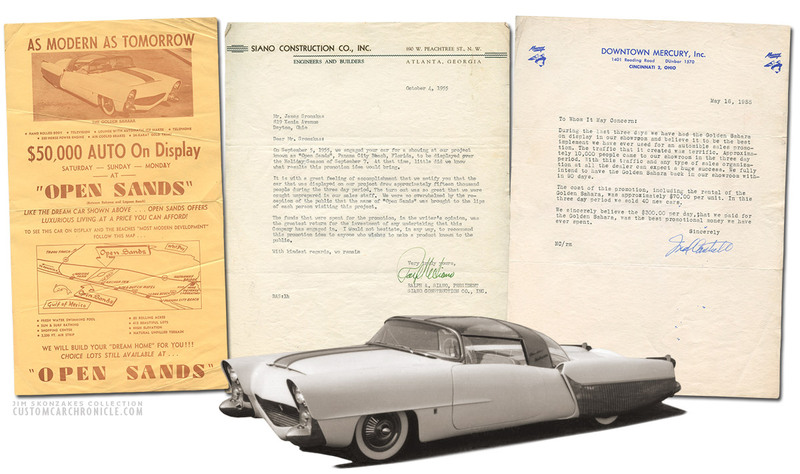 In the end it was decided that the car would be built at the Barris Shop as a Barris Custom, and that Jim would be the owner and financier of this futuristic project. A project both people involved already assumed would have a big impact on the scene even before the project was started. But they never realized how popular the Golden Sahara would become, and how much impact the car would have in the history of the Custom Car. Jim also could not have assumed at that time, that the Golden Sahara would set the path for the rest of his career…. But more on that in Part II. Plans called for a heavily restyled body with a very futuristic bubble top design, some characteristic parts from other cars, and a lot of scratch built details. Something never before seen done on a Custom Car back then. The whole idea had more the vibes of a factory design study, which was exactly what Jim loved to see in a Custom Car. Due to the busy work schedule at his parents Dry Cleaning business Jim could only visit LA a few times during the built, and was not able to see if the work done on the project would meet his standards. 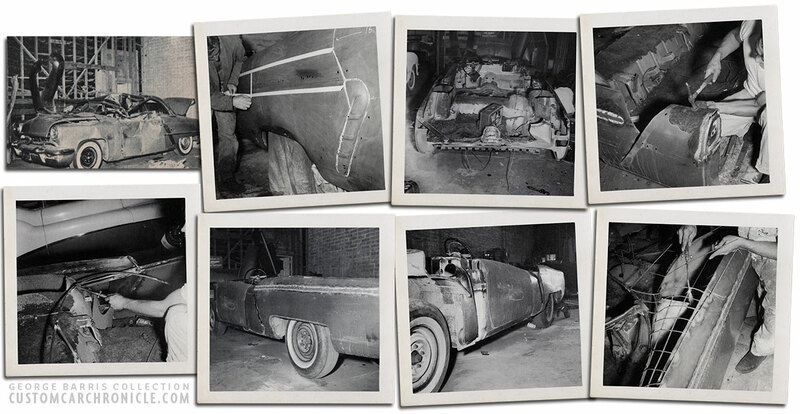 Several people worked on the car during the time it was build. But Bill DeCarr (Ortega) was the one who did most of the work, and could be considered the head of project. Jim always liked Bill very much, and thinks he is a really great craftsman. But due to different aspects the work done on the Golden Sahara was nerve really up to Jim’s Standards. Under construction photos from the work done at the Barris Shop. The project was a major undertaking, first deciding what should go, replaced with new body panel, reshaped panels and all new body work. Bill DeCarr is credited for doing most of the work on the original version of the Golden Sahara. Bill DeCarr lifting the top of the firewall/cowl after cutting it apart for the body sectioning. The top of the car, the top of the rear fenders and the trunk were removed completely. When the project started there were no wrap around windshields available from production cars. 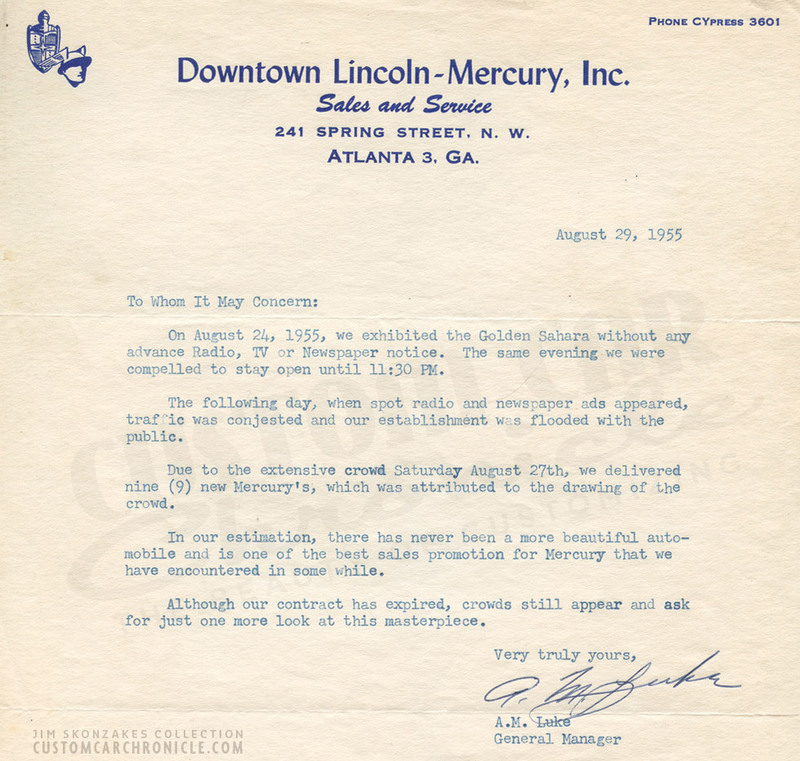 But Bill DeCarr, who worked a day job at the Lincoln Mercury dealer parts department, had seen samples of these wrap around windshield and knew they would become available in the very near future. So the cowl on the Lincoln was sectioned, and would later be reshaped to accept a pre-production test windshield for a 1955 Lincoln. The Lincoln doors where sectioned and the door tops were reshaped to flow down toward the back of the car, where they curved into a custom made scoop that would later be filled with gold colored mesh. The door opening she was reshaped with more grace. Most upper parts of the body were completely rebuilt out of sheet metal, shaped over a handmade wire frame, and welded to the body to create the desired body shape. 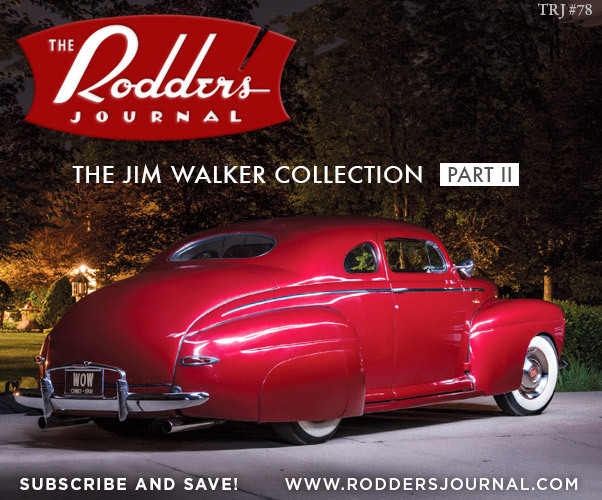 The completely reshaped rear fenders used 1954 Kaiser Manhattan taillights. Jim had bought a lot of parts from the Kaiser-Frazier dealers that were closing down in Dayton. He always loved those parts, and figured sooner or later he would be able to use those parts on his projects. The Bumperettes at the back – which also act as exhaust outlets – were created from leftover Kaiser bumper ends. The section below the gold colored side trim on the rear fender was made as a removable section, a huge fender skirt. The panel itself was gold anodized and clear coated strips of semi gloss were added – which gave it a beautiful effect with vertical gloss and semi gloss stripes. The fender skirt panel was surrounded by hand made trim which was later gold coated. A steel spare tire cover from an unknown 1930’s car was welded to the new trunk at a near-horizontal angle, but would never actually hold a spare tire. It was added for good looks and created some extra trunk space, which was very welcome in later years when the car was further modified for the Golden Sahara II, but more on that in the next issue. Freshly finished Golden Sahara photo taken at the Ford plant in Pico Rivera, CA where Bill DeCarr worked a day-job at the time. 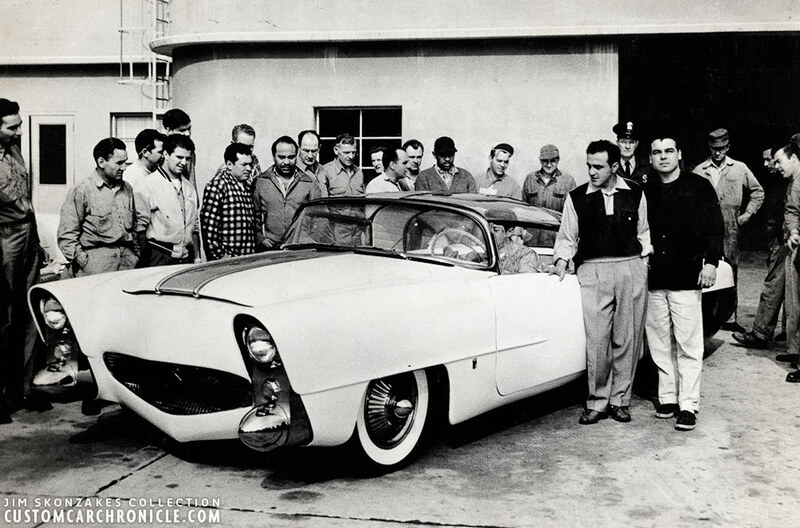 Jim Skonzakes can be seen behind the steering wheel, George Barris standing next to the car, with Bill DeCarr to the right of George. The Golden Sahara looked stunning in color with its refrigerator white painted body and gold coated parts. Not only the design of the GS must have looked totally out of this world, even the gold colored parts in an era where Chrome plating was hot must have turned heads everywhere. The “Targa Top” and rear window could be removed to create a full convertible. Wonderful color print of the Golden Sahara shows how the top panels could open up. Nice bird eye view of the Golden Sahara I. This is also one of the few rare photos I have seen so far that shows the GS with a license plate mounted at the back. This high angle give a good look at the huge plexiglass rear window that had to be created for the car. The front-end had been completely cut off and a new handmade nose was made with an oval shaped grille opening. This grille opening would later be fitted with a with gold plated extruded metal. The fenders were extended at the top and completely reshaped, the wheel openings were reduced downwards, compared to stock. The front of the new front fender has a large opening from top to bottom, which holds a vertically mounted gold pcolored metal mesh panel which serves as the base for the bullet-shaped bumperettes, created from part-box 1930’s headlights buckets the headlights and parking lights. The inside of the front fender top section was covered with the same gold plated metal mesh. With most of the car now roughly shaped it was time to create the top. 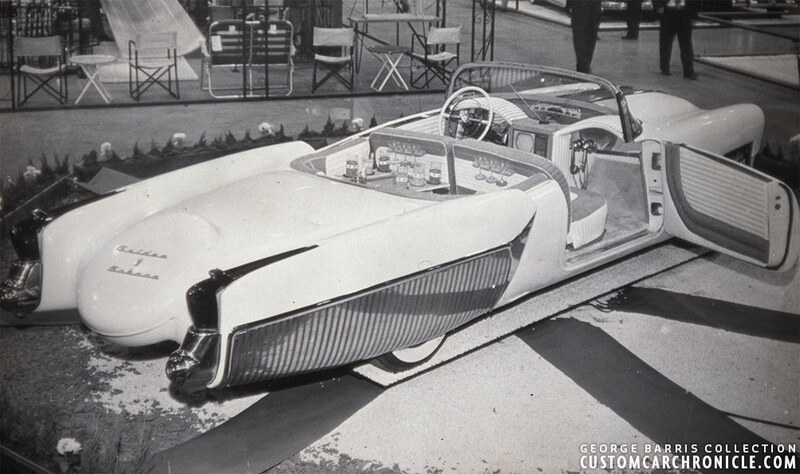 When Jim had the car designed he wanted to have a car that could have the top on, but he also wanted to convert it easily to a full convertible. The wrap around windshield had been arrived and installed and Bill DeCarr shaped a new panel that would be fitted as a large and wide B-pillar just behind the doors from side to side. Bill also made a thin roof panel that would fit between this B-pillar and the windshield header. 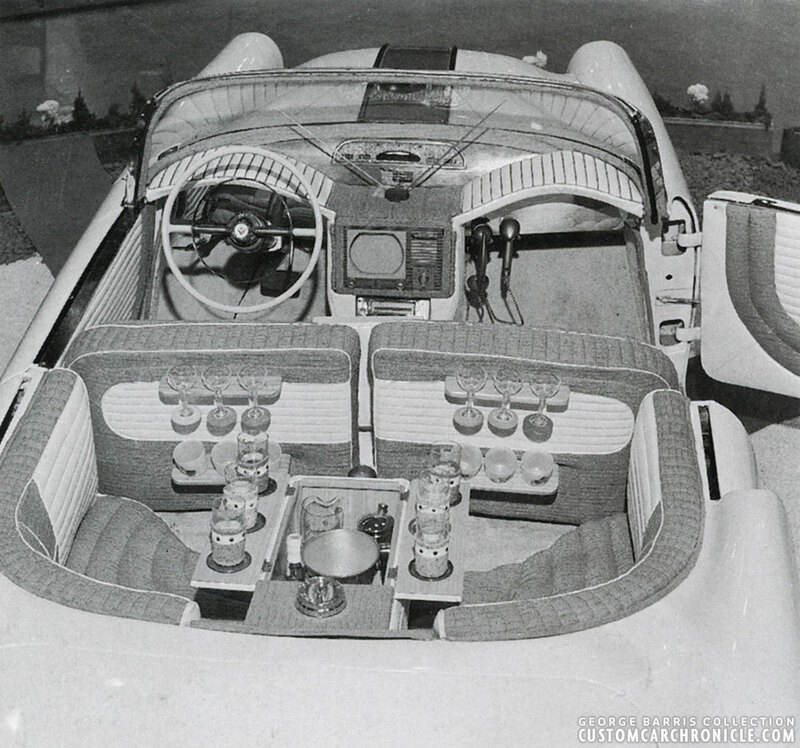 On either side of this, Plexiglas was shaped to form the “Targa Style” T-top. At the rear, a local Los Angeles company, create a huge rear window from plexiglass to match the wrap around windshield. All these panels were incorporated in such a way that they could be removed to create a full convertible. The styling on the Golden Sahara I was so far ahead of its time, and as these color photos show every body line worked together to enhance the overall look. 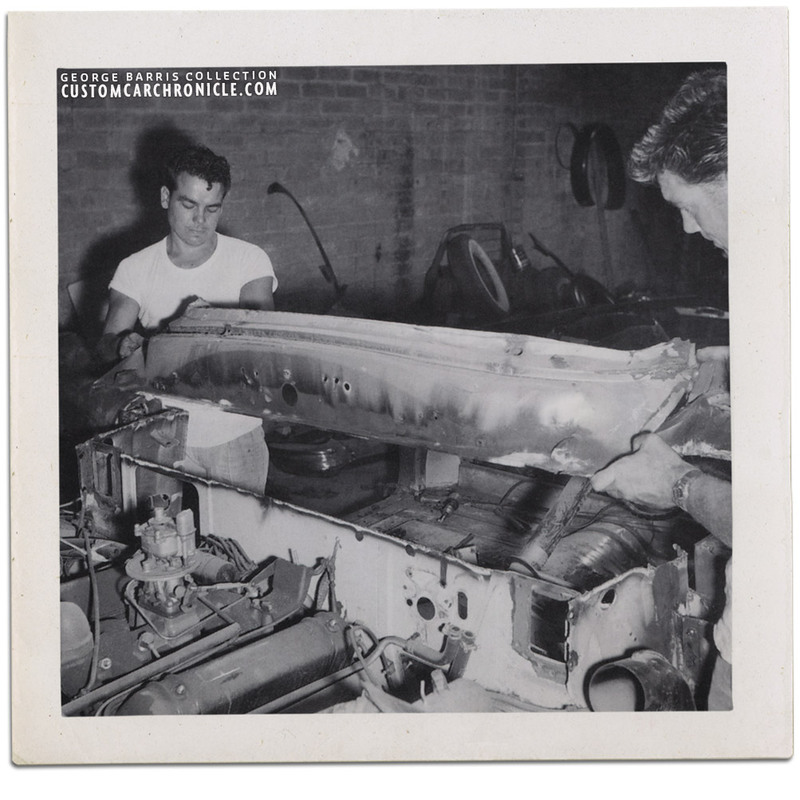 While the Barris Shop had performed most of the work on the Golden Sahara, Jim Skonzakes hired John Getz to do some final detail work and get the car up to the Factory Design Car Standards he was looking for. The work done at the Barris shop was really fine, but done in the typical Custom fashion, looking good from a few feet (which was sort of the standard back then). The Car lacked a bit in details Jim thought where very important to the car. When all the body work was finished and in primer. The parts to be plated were sent out for gold color plating, which would set the car even more apart from the rest, where chrome plating was the standard. For paint Jim chose a solid refrigerator white to be the perfect color for this amazing Custom Car, the white would create a good contrast with the gold colored metal. It was George Barris who came up with the name for the car. “The Golden Sahara“. Exotic and mysterious… just as the car. One of the very few photos that show the Ohio 1954 License plate mounted on the Golden Sahara. 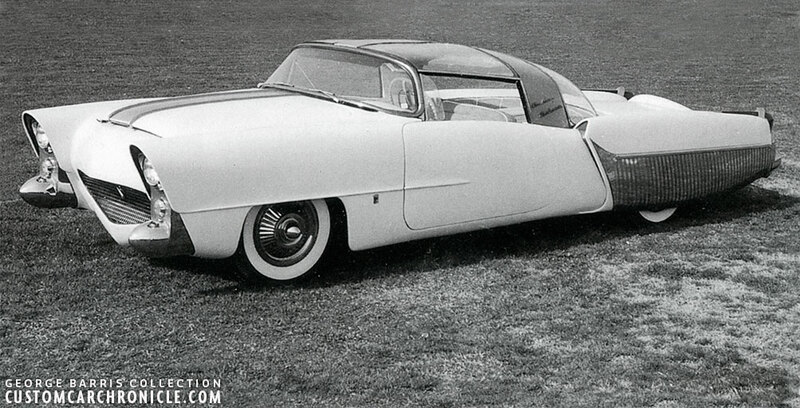 This photo was used in the May 1955 issue of Motor Trend magazine. A good look at the beautiful lines of the Golden Share with this rear 3/4 photo. 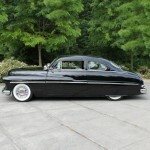 The ’54 Kaiser Manhattan taillights look right at place on the car. 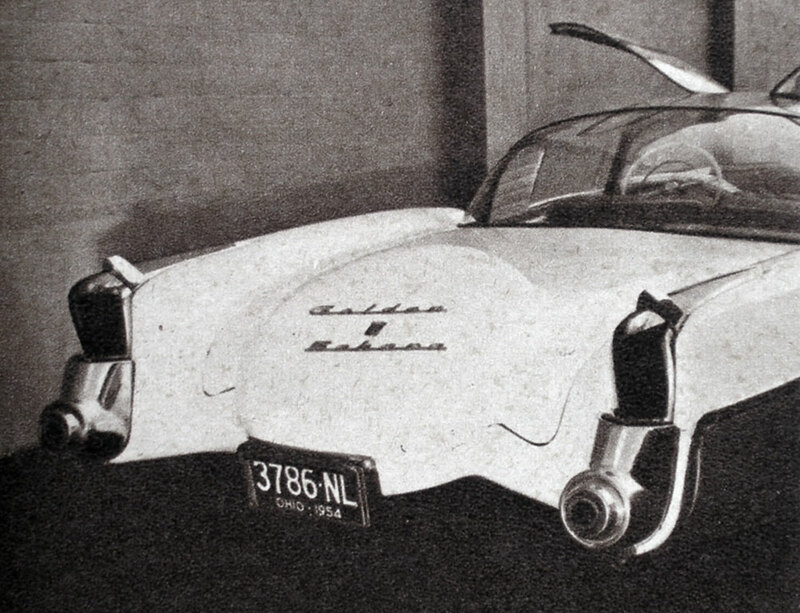 The rear bumperettes/exhaust tips were created using Kaiser bumper ends. This low angle photo also shows that the T-Roof panel is relatively this. It had to be lightweight so it could be removed with ease. Photo showing the beautiful lines of the Golden Sahara. Notice how the angle of the front of the front fenders is identical to the scoop/leading edge of the rear fenders. A wonderful experimental interior was created by Glen Hauser of the Carson Top Shop. Glen used gold brocade cloth and white leatherette to stitch up the unique interior. 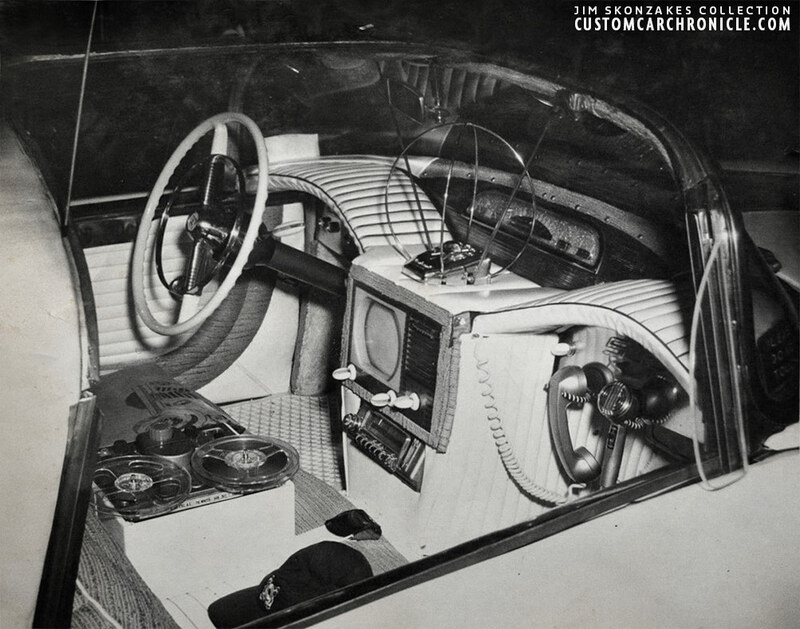 The dashboard was hand built, completely upholstered, and held a TV in the center and a tape recorder in the console. There was also a telephone, radio, and a loudspeaker system installed. In the back of the car, a full bar, with mini-fridge was installed in the center and a comfortable half round bench wraps around it. The floor was covered in plush white and beige mink carpeting. All the electronic equipment was the installed and incorporated by Jim Skonzakes himself. 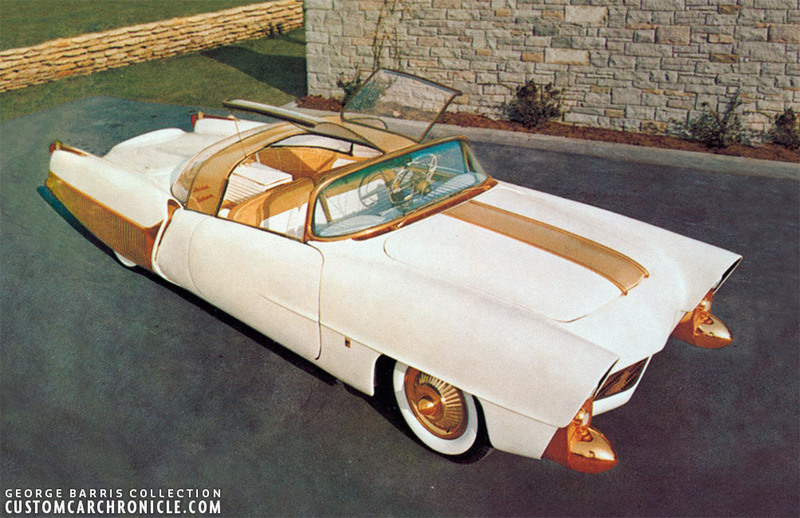 The Golden Sahara was a unique custom in its first form, and it won the Sweepstakes at the 1954 Motor Revue, held in the Los Angeles Pan Pacific Auditorium. And would later win many more trophies. The total cost for building the Golden Sahara I was estimated to be $25,000. – a substantial amount of money in 1954. Jim really enjoyed his new Custom Car and all the attention it got at the shows, but Jim was never completely happy with it. Jim mentioned the car was very nice from a distance, its design overwhelmed you, but when you got up close, he saw all kinds of flaws which he loved to fix at one point. When he drove the car for the first time he discovered that the frame of the car was never fixed properly after it was (slightly) bent in the George Barris accident. This made the car rather hard to drive. 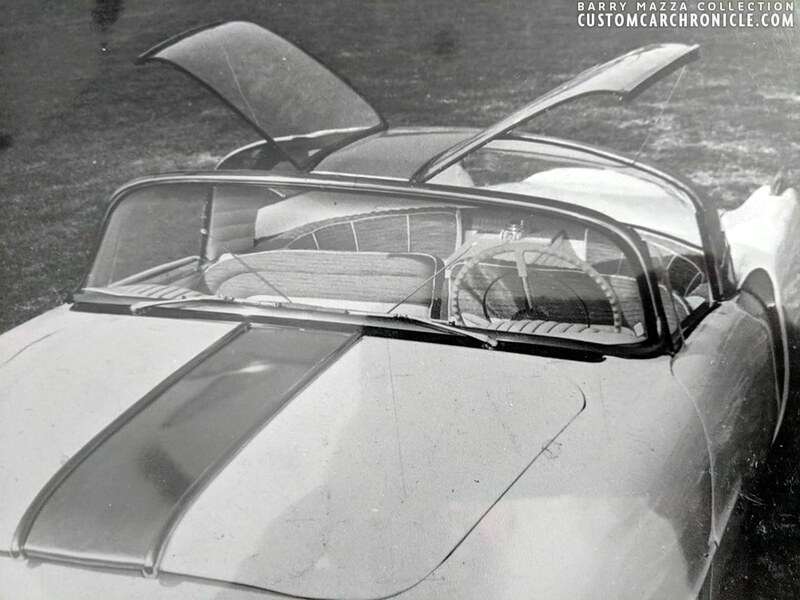 But since Jim had spend a small fortune on the car he decided to make it all work and showed the car all around the U.S.
Close up look of the plexiglass semi gull-wing roof panels. The interior of the Golden Sahara I was state of the art in 1954, this photo nicely shows the huge tape recorder in the center console. Notice that this photo shows white rubber mats on the floor, to protect the white and beige carpeting. 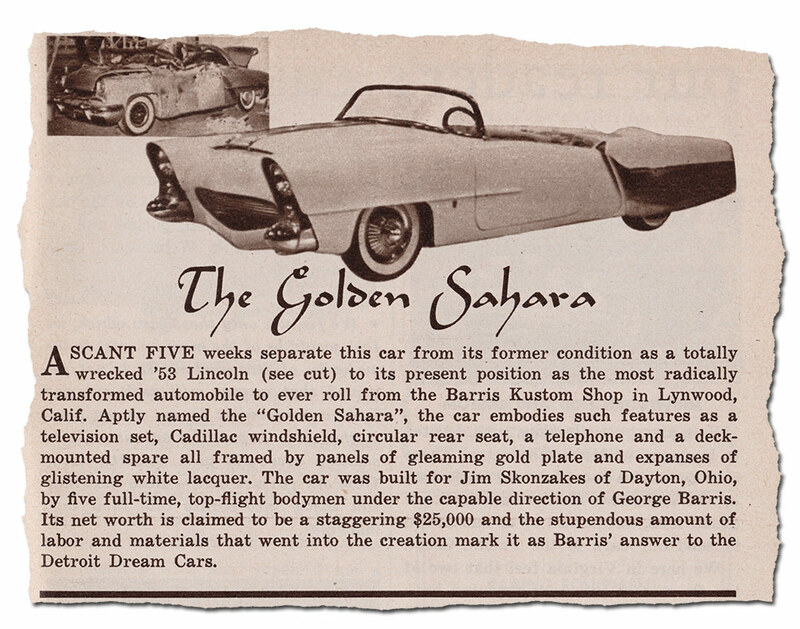 The big debut for the Golden Sahara was at the 1954 Petersen Motorama / Motor Revue. 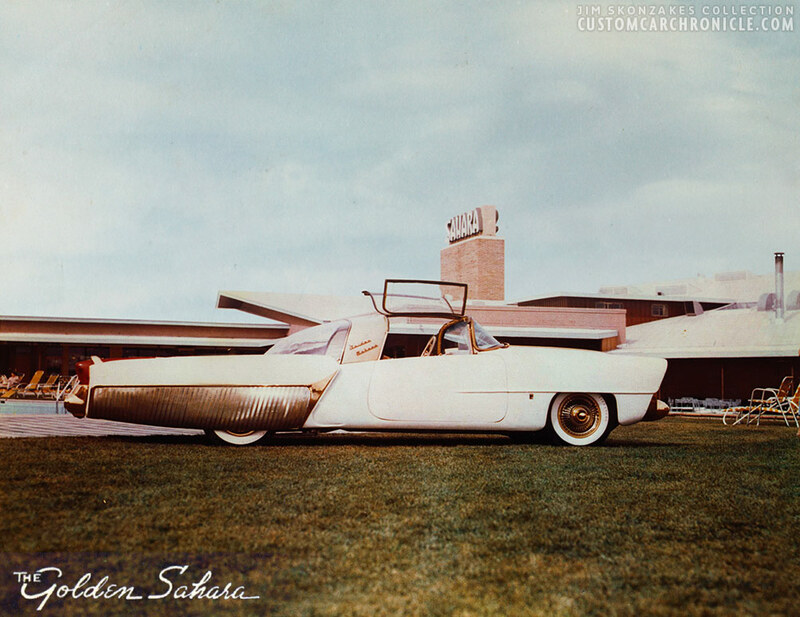 The Golden Sahara was a unique custom in its first form, drawing a huge crowd where ever it went. 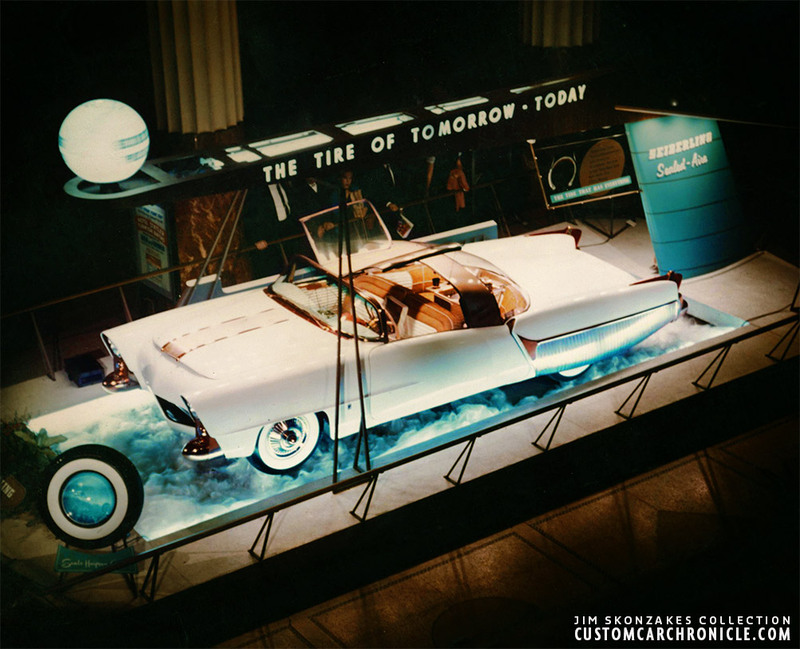 In the previous year Barris always had a huge wall side display at the Petersen Show at the Pan Pacificc Auditorium. 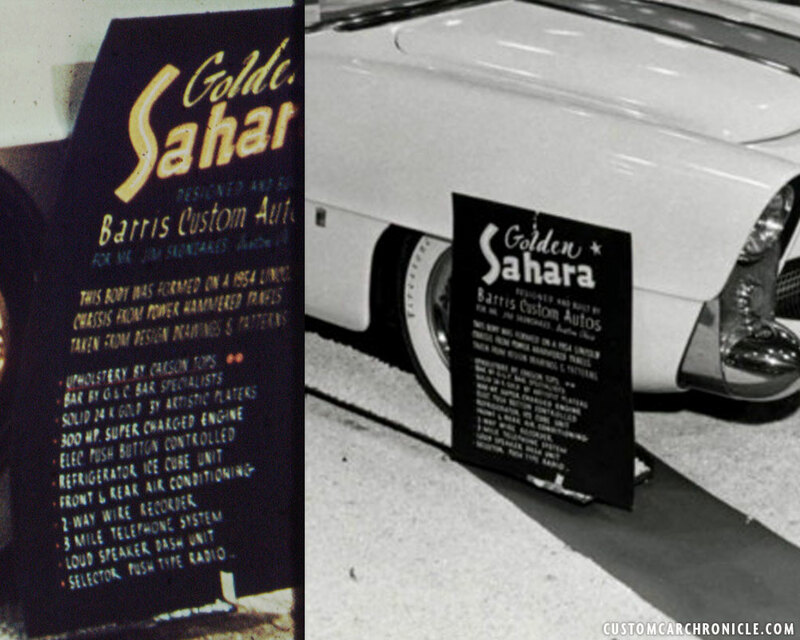 But with the Golden Sahara they realized this car could have a huge impact on the Barris Shop. So they went all out and The Barris crew and Jim Street created a large display with the Golden Sahara on a turntable. 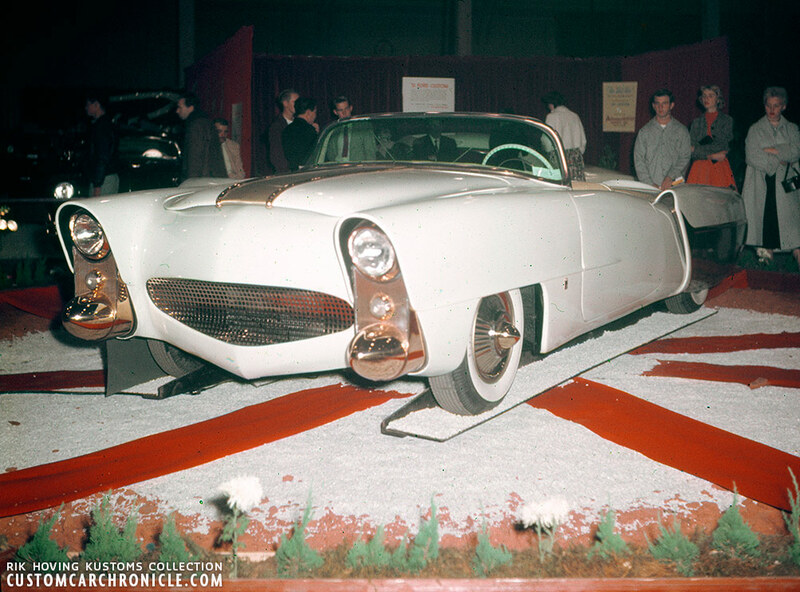 The car won the Sweepstakes at the show an was enjoyed by a huge crowd, of which many were especially drawn to the show to see the well announced Golden Sahara. The show was held November 5-14, 1954, more info and photos of the show can be found in this CCC-Article. Color slide taken by Walter Wyss shows the amazing display they had created for the Golden Sahara. Both George Barris and Jim Skonzakes knew how much impact this car would have on the audience, and they also knew how to get the best publicity out of this all. The Golden Sahara I was a huge hit at the Motorama Show, and soon Jim received phone calls and letters from other show promoters in other States asking for the Golden Sahara to be present at their shows. During the 1954 to 1956 Car show season, Jim Street took the GS-I touring around the US to all the big and not so big shows enjoying the crowd that was always gathered around the car. 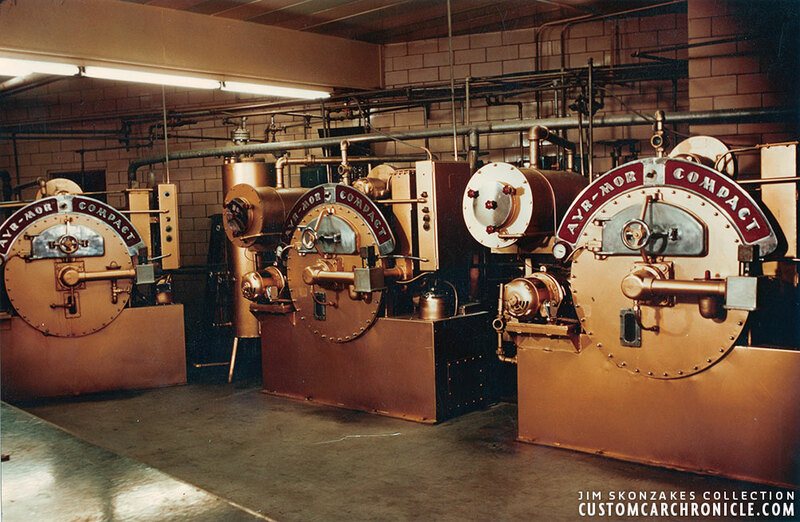 This wonderful color slide was made by Ina-Mae Overman and gives us a good look at the wonderful interior created by the Carson Top Shop. At most indoor shows the complete top was removed to show of the incredible interior. 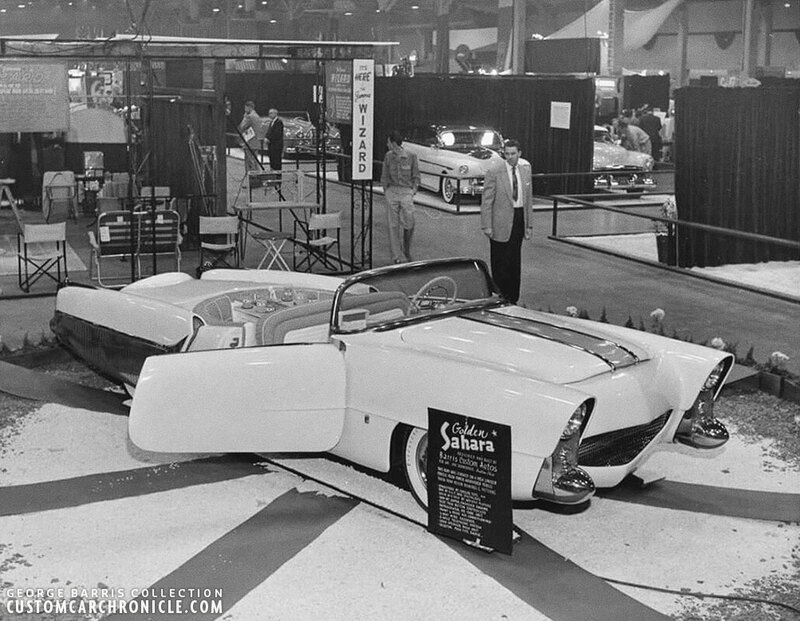 The Golden Sahara I was displayed at the ’54 show without the top. This way the beautiful futuristic Carson Top Shop created interior could be shown better. downside was that the audience could not be in awe over the huge bubble top rear window. Which must have been spectacular in 1954. Jim and Barris had a beautifully hand lettered sign made for the debut of the Golden Sahara. Ina Mae Overman had most of the sign in one of her color photos of the car. With some sharpening and adding contrast I was able to read most of it. 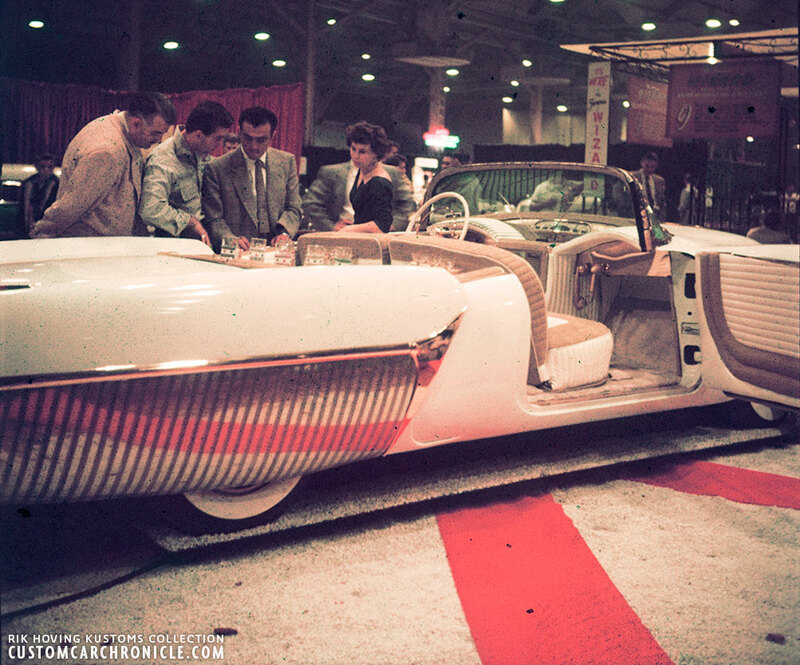 During most of the show the passenger door was left open so that the audience was able to take a better look inside the Dream Custom. The Drivers door remained shut so the overall profile could be enjoyed as well. The Interior was filled with the latest gadget’s as a TV, telephone, fancy radio, speaker etc. The back had a beautiful wrap around cocktail bar seating arrangement with full bar. Walter Wyss captured Jim Skonzakes talking to George Barris at the ’54 Motorama Show. We have no idea who the other people are in the photo, but since they are inside the display, they must know either George or Jim. 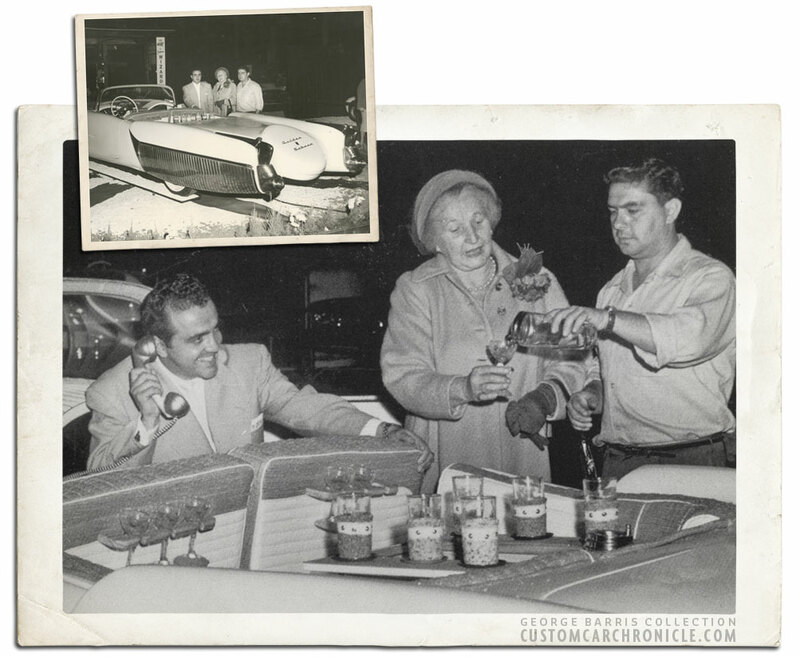 George and Sam Barris proudly showed Aunt Edith around at the Barris Display during the 1954 Peters Motorama Show. And the highlight was the recently finished trend setting Golden Sahara. 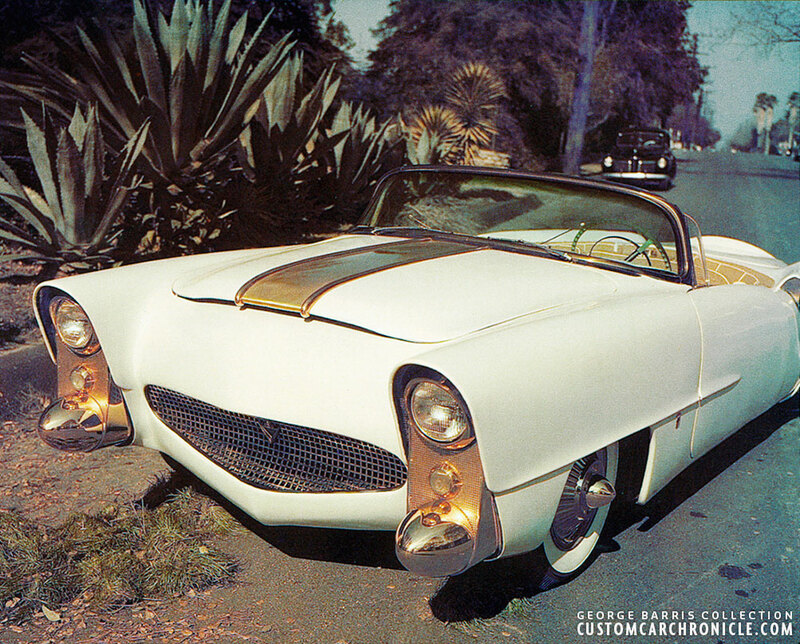 The February 1955 issue of Rod & Custom magazine announced the Golden Sahara. 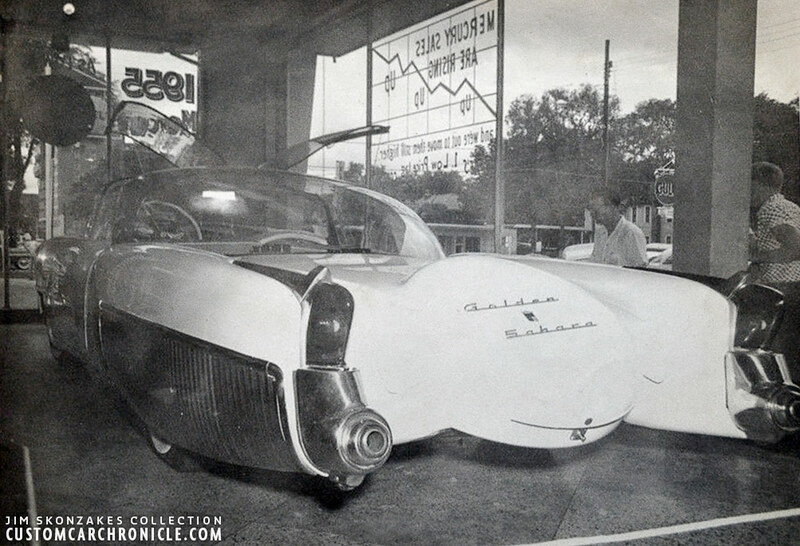 It was all part of a marketing plan to promote the car as good as the Barris shop and Jim Skonzakes could do. 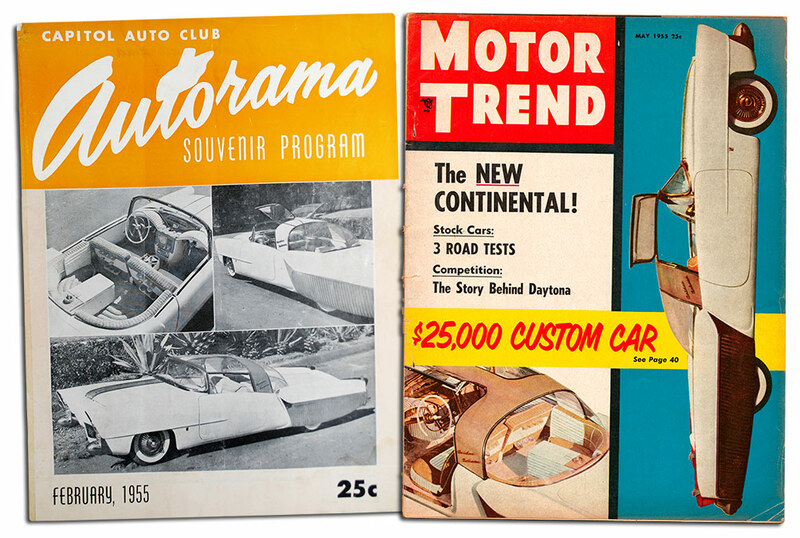 On the cover of the 1955 Sacramento Autorama Show Program, and the May 1955 issue of Motor Trend Magazine where Jim’s Golden Sahara I was named “The $25,000 Custom Car”. 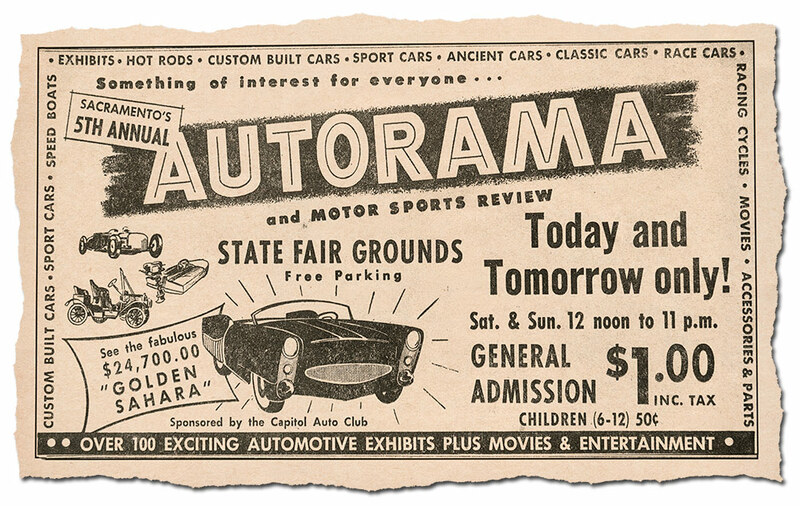 Announcement newspaper ad for the Saramento Autorama with the Golden Sahara I as the main attraction. 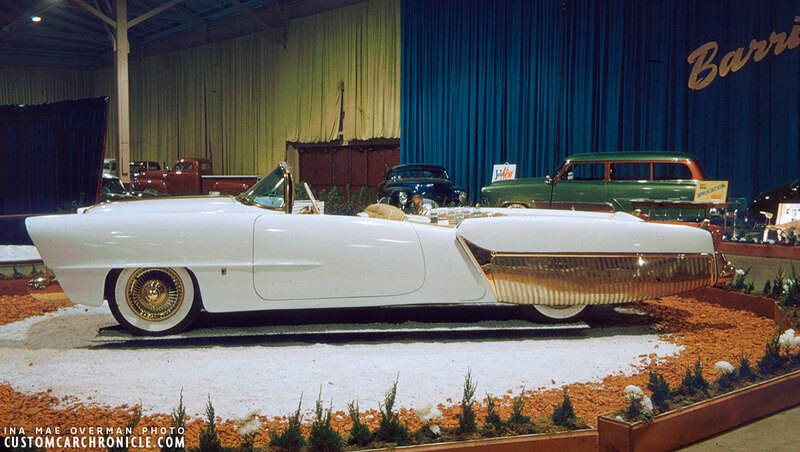 When Jim and George Barris developed the Golden Sahara it became clear that it was going to be an unique automobile. And that with the proper marketing the money invested in the project could be made back, and the Barris shop name could receive a huge boost. Show promoters saw the potential of this crowd pleasing custom and started to offer money for its display at their shows around the US. And soon Jim came up with a plan to rent out the Golden Sahara to car dealers for promotional of the dealers products. Jim provided the car, photo material and text which could be used in advertising the dealer events in local news papers and flyers to be spread around town. The Golden Sahara-I being displayed at one of the numerous Car dealers around the US. The Golden Sahara I proved to be the excellent tool for drawing a huge crowd, and dealers who had rented the Golden Sahara for a weekend or week soon were flooded with extra orders. The news spread quickly and soon it became a full time job to drive the Golden Sahara to dealer locations all over the US. Jim had to hire people to make it all happen. In the end everybody was happy Barris, with getting all the exposure of the Golden Sahara being build at their shop, which has undoubtedly led to new clients, Jim Skonzakes for all the exposure of his dream Custom, and the money made by renting out the GS-I to earn back the $25,000 bill for creating it, and saving up for the next phase. And all the dealers who rented the car who all had multiple new cars sales because of it. Jim had special note-books printed to make renting out the Golden Sahara as easy as possible. Car Dealers, but also other business could rent the Golden Sahara for a certain amount of time to help promote their business. The Golden Sahara was extremely successful in drawing a crowd, especially if the dealer had made flyer, or local newspaper announcements. On the left is just one of the many flyers that Jim saved, and two of the many Thank You notes from very happy car dealers, who had the Golden Sahara on display. Another sample of a very happy car dealer from Atlanta, Georgia, who had the Golden Sahara on display in their showroom. News like this spread around quick, and the was a huge demand to have the Golden Sahara on display to attract new customers. 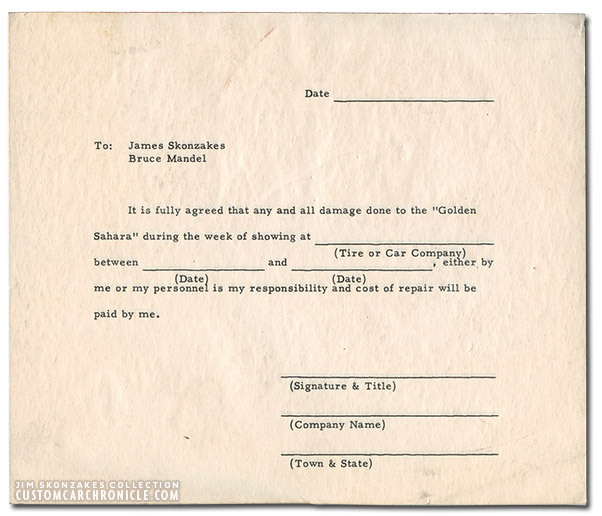 Another way of promoting the Golden Sahara was making a deal with Seiberling Tire Company. 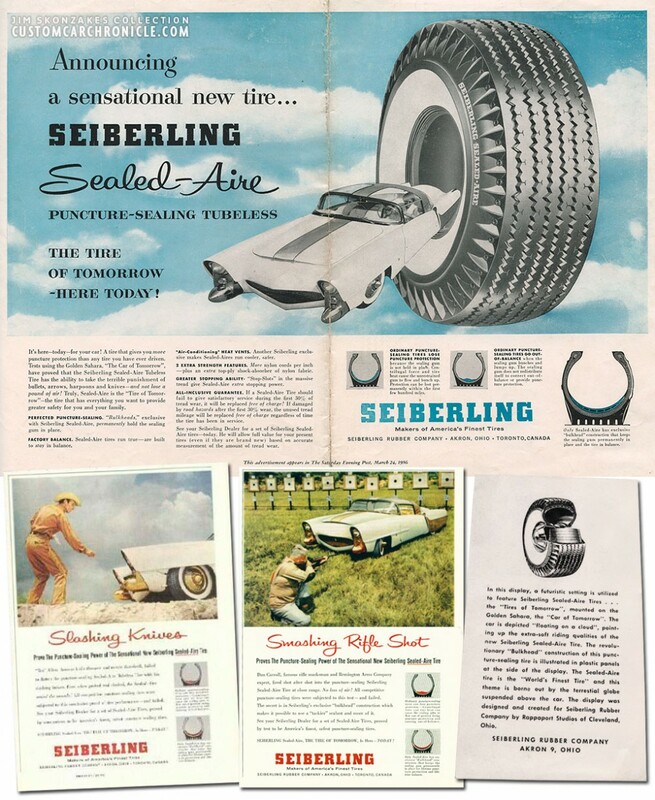 The Golden Sahara would be used in a special series of magazine ads promoting the Seiberling Sealed-Air The Tire of Tomorrow Here Today campaign. 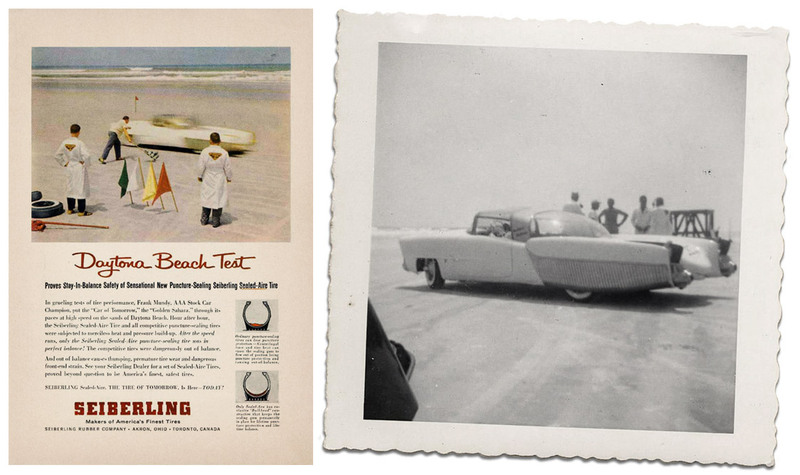 Photo shoots with the Golden Sahara were organized, even a shoot at Daytona Beach in Florida where the Golden Sahara can be seen racing at the beach with the new Seiberling tires was done. In 1956 when the car had paid for itself and more Jim decided it was time for the next phase. With all he had learned and all he had experienced with the Golden Sahara I he was confident that the plans he had in mind for the Golden Sahara II would make it en even bigger success. The Golden Sahara I on display to promote the tire of tomorrow today for the Seiberling tire company. 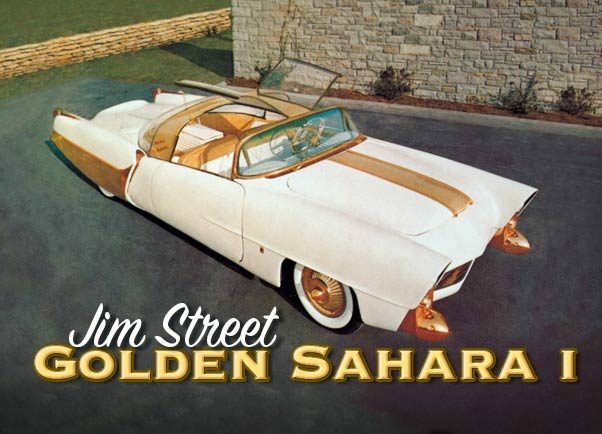 Many people absolutely adored the Golden Sahara I, and many tried to buy it from Jim, including Liberace, who according to Jim, desperately wanted to have the car in hi garage. However the GS was not for sale. 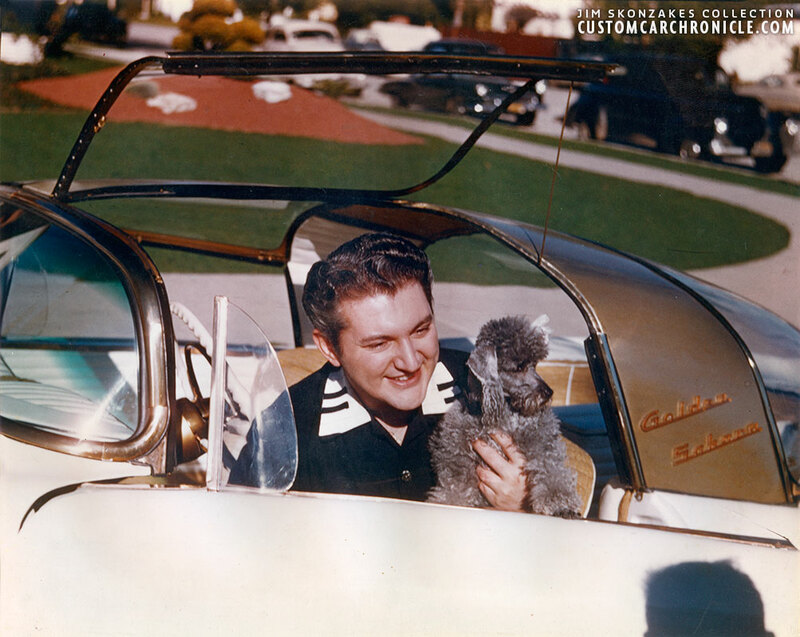 This photo of Liberace in the Golden Sahara was develop in December 14, 1956. Can you imagine what the impact of the GS I was, if you compare it with the cars in the street in the background. Jim showing some of the details of the Golden Sahara to Liberace. 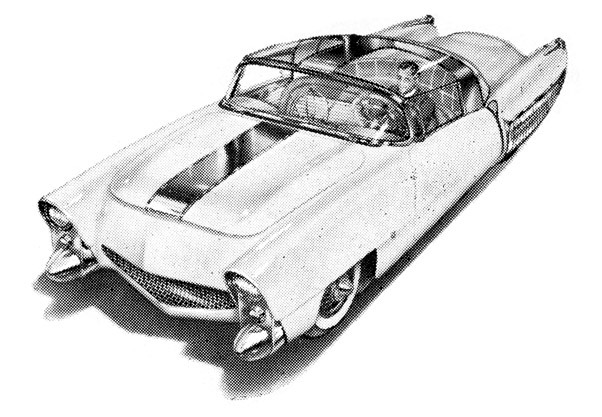 As wild as this first version of the Golden Sahara was, it was still relatively mild, compared with the plans Jim Street had in mind for the Golden Sahara II, which he began building in 1956, and which will be in PART TWO of this article. Another great in-depth article as always Rik. As famous as this car is many don’t know the true circumstances behind it’s creation or the 2nd version as well. Thanks for shedding some light on it for us true custom disciples. Like other I am watching for the auction to see what happens in the next chapter of this fabled cars life. 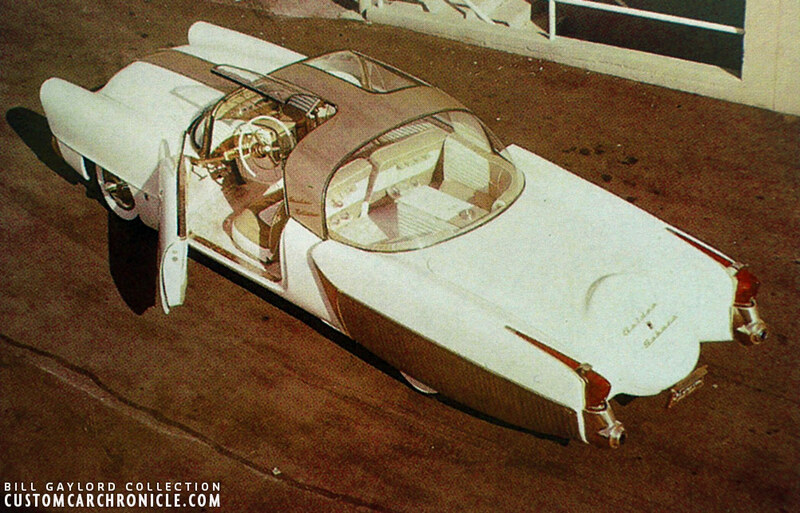 I agree with Torchie that this was a very complete article on the most futuristic custom of its time. I found out lots of new information, like what windshield they used to build it. Thanks Rik for a great story.